Did IMF grant a loan with no (reform) conditions to Romania in 2009? While in January 2009, President Traian Băsescu said that the last thing Romania would do would be to sign an agreement with the IMF, his tone softened to agree an IMF monitorization (but without any conditions put on by the IMF) and eventually, Prime Minister Emil Boc signed the new agreement in June 2009, Boc arguing that the loan will be taken exclusively by the National Bank of Romania to consolidate its reserves. The IMF and EU agreement gave Romania a 20 billion € line of credit of which the National Bank of Romania and the Romanian government took 17.9 billion € and which should be gradually returned by 2023, giving a total average interest of 15% (2.74 billion €). So other than a non-trivial interest rate, that suggests there were no other structural/reform conditions which the IMF usually attaches to such loans. I've also read the IMF's press release on the 2009 loan to Romania, and I see no obvious mention of conditionality either. So, is it really the case that there were no reform conditions attached? 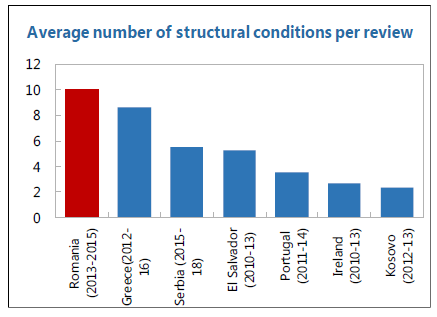 (Romania was indeed already a EU member in 2009, but then so was Greece and the IMF surely was not (and still isn't) short of demanding structural reforms in the latter country...). And if the answer is a trivial "yes" in the case of Romania, were there similar no-condition loans given by the IMF to other countries in the immediate aftermath of the 2008 financial crisis? Or is Romania's case somewhat unique? Apparently the answer is "no". There's a database with conditions attached to loans, and the 2009 Standby Agreement (SBA) with Romania had plenty of those, including pension (legislation) reform, reform of Romania's central tax collection agency (ANAF); these were present since the original May 2009 agreement. There were also some very specific conditions like "Eliminate by government ordinance the legal basis of stimulente funds, effective January 1, 2012" (I have no idea exactly what that refers to; that one was added in March 2011, so apparently the SBA was updated then with new conditions.) The entries in this database have some paragraph/article references that probably relate to text of the SBA, which I wasn't able to find just yet. I guess there's a substantial lack of manpower in updating Wikipedia. Not the answer you're looking for? Browse other questions tagged economy romania financial-crisis international-monetary-fund or ask your own question. Did the Greek government take on private debt? Why did the presidents of US and Romania contradict each other about the Visa Waiver Program? Why do politicians care so much about economic growth? Or: Why did the US need a tax reform? How far up the banks' hierarchy did the LIBOR rigging convictions (and prosecutions) go? What was the largest case of fraud involving TARP money (financial crisis bailout funds)? Did Germany profit from the (third) Greek bailout? Did the New Economic Policy ever end?